As President Donald Trump fires the first broadside in a trade war with China, concerns are growing in the USA over the growing presence of China in the vicinity of the Panama Canal. In a recent appearance before the United States Senate, Kurt W. Tidd, head of the Southern Command, warned about the penetration of the Chinese in an area so strategic for Washington, as the Panama Canal, reports La Estrella de Panama. A report in the Spanish newspaper 'ABC' indicates that in addition to the economic rivalry that has always existed between the two countries, Beijing also poses a Trojan horse security challenge for the United States, with its presence in the interoceanic route. The Torrijos - Carter Treaty, for the return of the Canal, guarantees free international transit and reserves Washington the right to intervene if that freedom is threatened. The waterway is fundamental for communications and trade between the two US coasts. Tidd, quoted by the Spanish newspaper, said that "the greater scope of crucial global access points such as Panama creates commercial and security vulnerabilities for the United States." He said that China’s plan to extend their New Silk Road project to Latin America and the policy of granting credits to the nations of the area represents an opportunity for the Asian country to expand its influence on key partners, promote business and improper labor practices. The possibilities of the port terminals managed by the Chinese and adjacent to the interoceanic canal to become part of the so-called 'pearl necklace' (ports operated by China on strategic routes to facilitate stopovers of its fleet) has also been cited by the 'Wall Street' Journal 'in its publication' Navy Faces Global Chinese Maritime Threat '. China is the second user of the Panama Canal, after the United States, and the largest supplier of goods in the Panamanian free zone, which is the largest in Latin America and the second in the world. Panama is currently negotiating a Free Trade Agreement (FTA)with China. In the Atlantic, the Chinese company CCCC (China Communications Construction Company) has built 30% of the new Panama Colón Container Port, a terminal that will facilities suitable for the new dimensions of the Expanded Canal and multipurpose ships. and a station for the reception of liquefied gas. CCCC is one of the largest port construction and design companies in Asia. The company Hutchinson Wampoa, of Hong Kong, has been managing a port terminal for two years at the southern entrance of the Panama Canal. With an investment of $ 165 million, in Amador, the Chinese company CHEC is part of a Cruceros del Pacifico consortium to build a new cruise port. Two Chinse companies are involved in the bidding for the $1 fourth bridge over the Canal. PANAMA | U.S. TRADE DEFICITS IS A POWER STRUGGLE Facts stated above is not meant to be confusing. Nations plied their NAFTA agreement and now they claim U.S. is not playing by their international trade rules. U.S. in previous administrations has not qualified the right president for trade negotiations. Trade negotiations are essentially scare tactics against the U.S. "U.S. does not do this trade deal the way we want it, the U.S. will be to blame for a world economic upheaval, etc." - paraphrase Mean while the U.S. approaches near a $trillion in trade deficits and the nations are saying... "no, look at the numbers this way with news media backing." - paraphrase Complications on this matter effects the U.S. budget and national security, the U.S. steel industry and encourages theft of intellectual property. U.S. has been in the dark so long with Democrats aching for a "...Socialist..." government there is simply no constructive economic and national security direction until the election of U.S. president Donald Trump. Panama needs to stay alert of the news as this power play against the U.S. can have adverse effects on Panama politically and economically. PANAMA | TIRING IS COMPLACENCY Facts and more facts are warnings eating away at tax payer's $$$. Facts can be subtle and missed pointing to an enemy strategy. If I were to say your grandmother is dying you may say... Yeah, but she is getting old. If I were to say your father or mother is dying, you may say... Oh my gosh, who is going to pay the mortgage? What will I do? If I were to say, Panama is vulnerable with the canal, you may say... U.S. protects Panama or it's just a small nation, so what? If I were to say, there is a sense Panama will be attacked! Stating all the facts, the world would jump on any information. If I was wrong, the facts still holds some truths. If I were to write nice interesting comments about every nation... that would be deceiving myself and the rest of the world. Facts do not go away if everyone looks for it. It appears folks are ready for a good heart warming story. Folks ready to take that long vacation with their family, etc. Politicians are paid to do all the worry for us. Then we blame the politicians when they allow the trojan horse. I believe the U.S. teaches that in world history. How about the Art of War? Nuclear threats is basically the Art of War. Finance a nation after it has the leverage... Allow the dictator financial power plays... Dictator rides out a new controversial election in the U.S. Dictator makes more demands and threats... Nations become fearful...The Art of the Deal?....or The Art of War? I don’t think I am alone at being unable to read George’s comments on here .......it’s really tiring. I wonder if he also speaks in bullet point form. ..? Anyway, might I just observe that the Chinese having a 30% stake in the construction of a port facility hardly translates into them having any control over a port facility in Panama. Also that hairy old chestnut that was trawled around 20 years ago about Hutchison controlling the Canal operation was put to bed decades ago when it was confirmed even by Washington “reds under beds” die hards that this Company is a Hong Kong based conglomerate publicly owned and registered on the London stock exchange and as we all locally know has absolutely no involvement with the Panama Canal. PANAMA | EUROPE AND THE IMMIGRATION PLAN Italy populist movement turned away refugees from entering its border. Italy has diverted the flow of refugee boats toward Spain. Spain provided special temporary stays with medical evaluations for refugees. Spain examines asylum applications while refugees face deportations. France accommodating CANADA IMMIGRATION PLAN 2018 -20120 REVEALED: Announcing the new plan, Canada’s Immigration Minister Ahmed Hussen said the targets were the most ambitious in recent Canadian history. Panama Credentials Committee and Goals in Question Panama French name political candidate if elected in question on issue of refugees. Panama French name political candidate if elected in question on issue of fair Free Trade agreement. Panama could face a flow of refugees and Chinese presence changing the racial and political climate. Panama : White population - 10%. PANAMA | USA TROJAN HORSE FEARS WITH CHINA / PANAMA United States improved policies with its main objection of protectionism. U.S. improved policies with raising money for it military fortification. U.S. improved policies with the politics issues of illegal immigrants. U.S. is now negotiating with North Korea denuclearization - nation building. U.S. continues to fight global terrorism and sanctions Iran - sponsor of terrorism. U.S. / China are having tariff issues with trade wars on the horizon. China expands with Silk Road Project in Latin America. China, Beijing poses a trojan horse security challenge to U.S. / interoceanic route. Panama is currently negotiating a Free Trade Agreement (FTA) with China. U.S. concerned with growing presence of China in vicinity of the Panama canal. The Torrijos – Carter Treaty, for the return of the Canal, guarantees free international transit and reserves Washington the right to intervene if that freedom is threatened. The waterway is fundamental for communications and trade between the two US coasts. French name presidential candidate for Panama if elected may pose a set of Free Trade problematic issues with unfair trade deals. CLIMAX OF A FORESEEABLE FUTURE: As the United States gets their House in order... Complications of an elected French name Panama president and China presence in Panama could pose interoceanic security challenge to the U.S. Panama / China Free Trade deal could place the nation into a trade deficit. China / Canada / France could seek concessions from Panama. China / Canada / France presence in Panama will limit access to United States navy interoceanic route near Panama canal vicinity. U.S.A. / North Korea nation building at U.S. tax payers expense... U.S.A. / China / Canada / Mexico / Europe trade wars... U.S.A. / Panama canal treaty at risk with interoceanic security challenges. 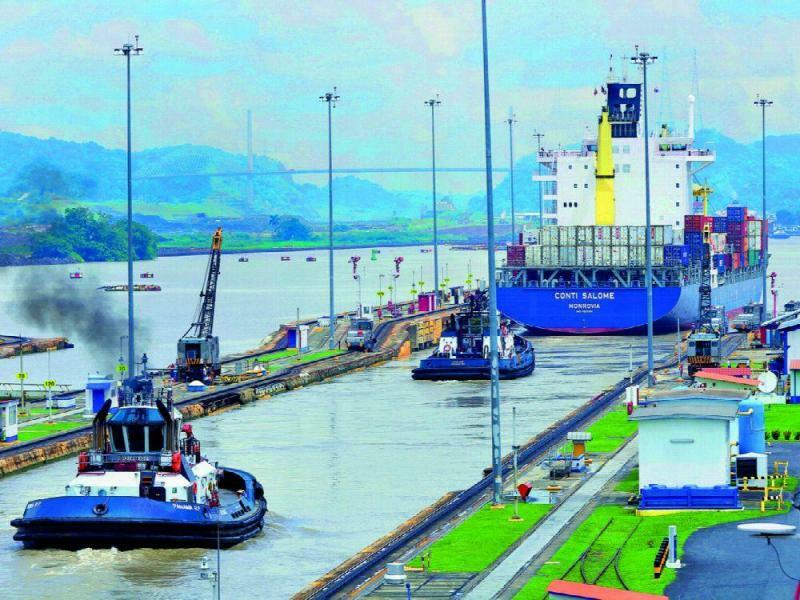 UNITED STATES STRATEGIC LAST RESORT: U.S. takeover of Panamax canal. China / Canada / France / Europe / United Nations condemns U.S. actions. Panama vicinity / China Seas dispute with nations increases threats of a major war with land and air military assaults.